The set features a generously over-filled comforter accented with accessories including bedskirt, pillow sham(s), cushion pillow(s), and a neckroll pillow. Fabric: 100% Polyester, Filling: 100% Polyester Fiber. Machine Washable. 5 Piece Twin: Comforter 68x86, Bed Skirt 39x75x15, (1) Pillow Sham 20x27x3, Cushion Pillow 17x17, Neckroll Pillow 7x21. 7 Piece Full: Comforter 80x90, Bed Skirt 54x76x15, (2) Pillow Shams 20x27x3, (2) Cushion Pillows 17x17, Neckroll Pillow 7x21. 7 Piece Queen: Comforter 90x92, Bed Skirt 60x80x15, (2) Pillow Shams 20x27x3, (2) Cushion Pillows 17x17. Neckroll Pillow 7x21. 7 Piece King: Comforter 102x 92, Bed Skirt 78x80x15, (2) King Pillow Shams, (2) Cushion Pillows 17x17, Neckroll Pillow 7x21. 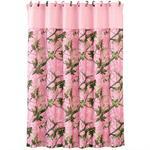 The Pink Camo ensemble features detailed, leafy oak camo print set on a tasteful pink backdrop. This curtain is made from 100% polyester. As part of the larger Pink Camo collection, a wide array of accessories. 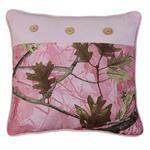 Oak Camo Hunter Pink Throw Pillow. Measures 18 x 18. 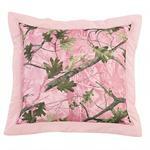 Oak Camo Hunter Pink Euro Sham (1). Measures 27 x 27. 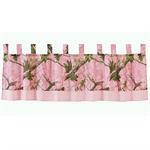 Oak Camo Valance Pink measures 84"x18"
Oak Camo Baby Crib Bedding Set Pink. This 4 piece camouflage crib bedding set includes the pink fitted crib sheet, Oak Camo 4 sectioned crib bumper, Oak Camo crib comforter, and Oak Camo crib dust ruffle. 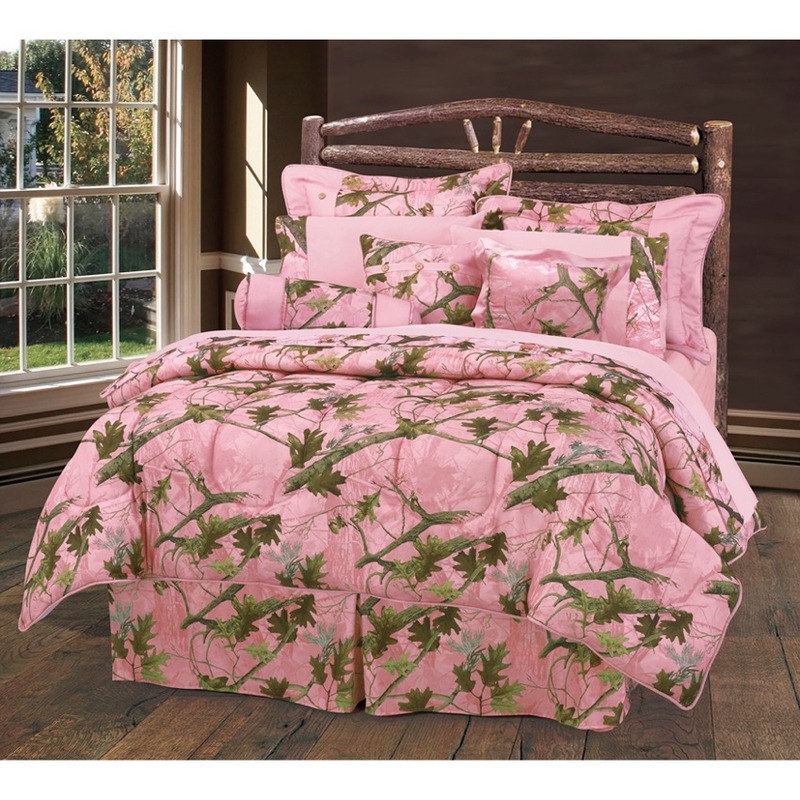 Soft pink sheets and pillow cases feature detailed, leafy oak camo border. Four piece full set includes one flat and fitted sheet and (2) king pillow cases.